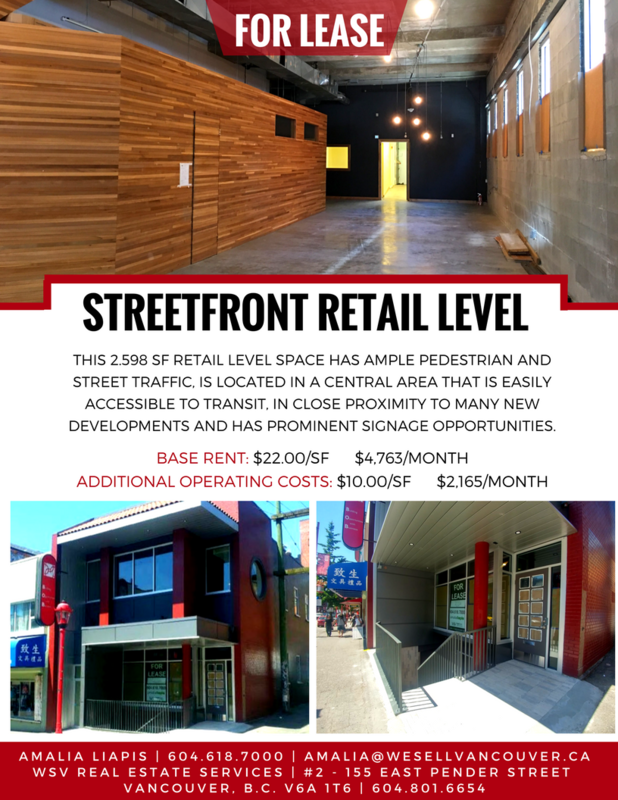 We've got a streetfront retail space available in a highly desirable area in the heart of Chinatown which has seen an influx of new developments. Vancouver\'s Chinatown is universally appealing to tourists and locals alike with its rich culture, striking heritage buildings and world-renowned delicacies. This location is in walking distance to Gastown, Strathcona and the Downtown Core and is in close proximity to transit hubs. The subject property boasts a unique layout with character storefront, exposed cement bricks, 16ft ceilings and polished concrete floors. This newly and extensively renovated unit is exposed to high vehicle and pedestrian traffic and has prominent signage opportunities which is perfect for a retailer, cafe, office or fitness studio! The unit also includes an enclosed board room, storage room, kitchenette and two individual washrooms. The space can also be accessed through a grade level loading door at the rear of the space. Contact Amalia Liapis at 604-618-7000 or alternatively at amalia@wesellvancouver.ca for additional information.